Reddy, a former minister and brother of late Andhra CM YS Rajashekhar Reddy, was found dead at his home. The family claimed it was an unnatural death. 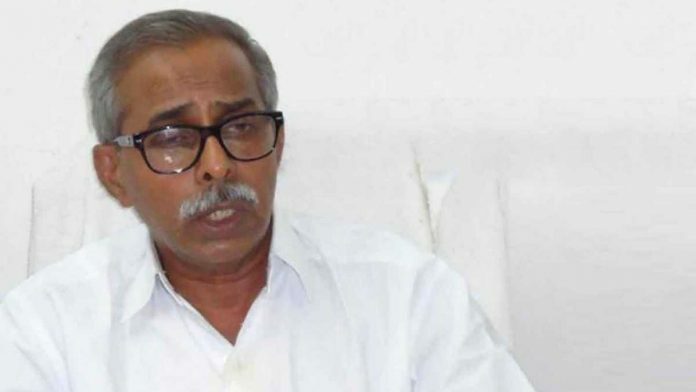 Amaravati: Y S Vivekananda Reddy, former minister and younger brother of former Andhra Pradesh CM Y S Rajasekhara Reddy, was Friday found dead at his residence in Kadapa district of Andhra Pradesh, with family members alleging that the death was not natural. Vivekananda Reddy’s personal assistant M V Krishna Reddy has lodged a complaint with Pulivendula police expressing doubts over the nature of the death as blood clots were found in the bedroom and the bathroom. The 68-year old leader is survived by his wife and a daughter. Vivekananda Reddy’s nephew and former MP Y S Avinash Reddy alleged that it was not a natural death and sought a thorough investigation. “There were two injuries on his head, one each on the front and the back. So, a thorough probe is required to establish the cause of the death. There could possibly be a conspiracy angle as well that needs to be probed,” Avinash Reddy said in Pulivendula. A case under section 174 of CrPC (unnatural death) was registered and the body moved to the Pulivendula government hospital for postmortem, a local police inspector said. YSR Congress president Y S Jaganmohan Reddy and his mother Vijayamma rushed to Pulivendula from Hyderabad on hearing the news. Known as a down-to-earth and genial person, Vivekananda was elected as MLA in 1989 and 1994 from his hometown Pulivendula in Kadapa district. He was elected to the Lok Sabha from the Kadapa constituency in 1999 and 2004 and to the Andhra Pradesh Legislative Council in 2009. He had served as the agriculture minister under N Kiran Kumar Reddy in the then united Andhra Pradesh. He had a difference in opinions with his nephew, Y S Jaganmohan Reddy, after the latter quit the Congress and established the YSR Congress, and chose to stay back in the parent party. Vivekananda even lost the by-election to his sister-in-law, Vijayamma, in 2011. Subsequently, the family differences were sorted out and Vivekananda Reddy joined the YSRC. Two days ago, he was seen at the Lotus Pond residence of Jagan in Hyderabad and on Thursday, Viveka, as he was known by, campaigned for the YSRC in Pulivendula constituency. He was alone at his residence in Pulivendula on Thursday night. “There was no response when I went to his house this morning. I called his wife in Hyderabad over phone and she asked me not to disturb him. Later, the cook and other household staff reached the house but they too did not get any response. I then went in through a side door and found Vivekananda’s body in the bathroom, with blood clots in the bedroom and the bathroom,” Krishna Reddy said. YSRC MP V Vijayasai Reddy expressed shock over the former minister’s death. “He was such a humble person who always engaged himself in public service. It is a huge loss to the YSRC and also the state,” the MP said in a message.